When it comes to Jesus, talking about his life is fairly common fare; talking about his birth is so ubiquitous as to conjure up the sound of sleigh bells; and talking about his death and resurrection, while perhaps more controversial, are likewise sufficiently ordinary as to draw out the smell of lilies whose stamens remain unscathed. It’s just not that common. “We have no trouble,” say Tim Perry and Aaron Perry, “with the other Christological miracles – the incarnation of God in Mary’s womb and the bodily resurrection of Jesus from the grave. Yet when it comes to the Ascension, we get bogged down by the funny picture of dangling feet” (111). I remember remarking to my congregation on Ascension Day this year, when preaching through Apostles’ Creed (not coincidentally, on, “he ascended into heaven”) and saying that the world has yet to get its mitts on the Ascension. There’s Santa Claus and there’s the Easter Bunny, but we have yet to see the Ascension Flamingo flap its way into our midst to accentuate – or ruin – our celebration of the day Jesus went to be with the Father. For that we can give thanks, while scratching our heads at the same time. Why? 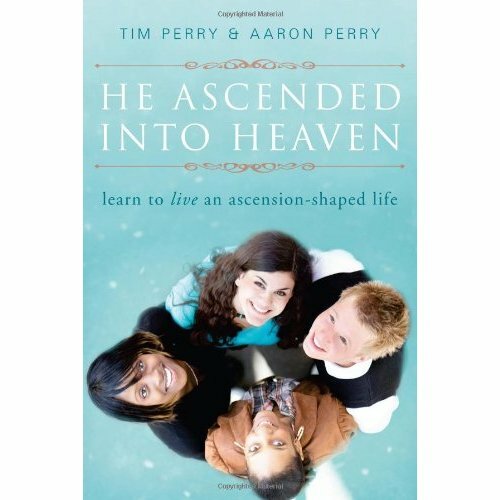 The confusion (at best) or lack of discussion (at least) is what Tim Perry and Aaron Perry seek to aid in He Ascended Into Heaven: Learn to live an ascension-shaped life (Paraclete, 2010). Tim and Aaron, brothers, are both actively involved in church life. Tim is an Anglican deacon in the Diocese of Rupert’s Land and professor at Providence College and Seminary in Manitoba, and Aaron is a Wesleyan pastor in Ontario. Tim has previously written Mary For Evangelicals, which is available from InterVarsity Press. The book is divided into two sections, looking at the Ascension and Jesus, followed by the Ascension and the Christian Life. In this way, the authors exegete the relevant Old and New Testament Scriptures, especially from the Gospel of Luke and the opening chapter of Acts, and then apply what is learned to the life of the follower of Jesus today. Each chapter is accompanied by a number of pertinent discussion questions for personal or group study. The Perrys want the reader to see the Ascension of Jesus in its broader biblical context and in the context of the life of the church. For example, they assert: “Luke wants us to comprehend the coming of the Spirit as the earthly echo of the heavenly enthronement of the victorious Son” (46). Too often, Christ followers move from the resurrection at Easter directly to the coming of the Holy Spirit at Pentecost – if they pay any heed at all to the Christian year. Yet the Great Fifty Days which separate Easter from Pentecost have a profound stop at the fortieth day – if we will pause to recognize it. Too often, perhaps because Ascension always falls on a Thursday, it becomes the echo of Easter – or something – instead of Pentecost being the echo of the Ascension. This book will help the reader to attune the ear toward the event of the Ascension as well as the echo that is Pentecost. The authors also help us to understand the inherent value of confessing our faith, in such historic words as those of the Apostles’ and Nicene Creeds, in which we affirm the importance of the Ascension of Jesus. They explain, helpfully, “The confession is a pledge of life and a practice of this pledge to the one who ascended, body and soul, into heaven and is seated at the right hand of the Father. To confess those words is to pledge our troth – our loyalty – to the one of whom we speak and to practice the identity these words offer” (61). One application that struck me particularly was to view the apostle Thomas in light of Jesus’ ascension. “Loyal Thomas, honest Thomas confesses the ascension truth: ‘My Lord and my God!’” (68, emphasis theirs). The take on Thomas alone makes it worth reading the book, yet it is just one example of how our reading of the Bible can be enriched by a deeper understanding of the Ascension. He Ascended Into Heaven: Learn to live an ascension-shaped life is published by Paraclete Press in the United States and available in Canada exclusively from Augsburg Fortress Canada – http://www.afcanada.com/store. I have also seen it offered on http://www.amazon.ca.